We manage all our cherry selection, milling, processing, warehousing and exporting facilities. We produce consistently high-quality coffee, offer support to our farmers and washing station managers, provide extensive information about each micro-lot producer, offer direct contact and ship quantities from a few bags to full container loads of coffee worldwide. We’ve chosen to use the most artisanal method of producing coffee as every cherry we use is hand-picked and then transported by the farmers to the washing stations. When they arrive at the washing station, the farmers take their cherries to barrels of water to see if any float. Any underdeveloped cherries will rise to the top and are removed. Only the ripened, non-floating cherries are kept and then taken to the selection tables to remove any that are visually defective. Once the cherry selection and sorting has been completed it must be approved by the washing station's selection officer. When it is their turn, the farmer takes their cherries into the buying hall and the washing station’s weighing officer checks the quality of the cherries once more by placing a sample of the farmer’s cherries in a bucket of water to make sure that none float. The farmer then places their cherries on the scale and the weight is recorded under the farmer’s profile. The cherries are then poured into the reception tanks in the buying hall. Each farmer receives a receipt for their cherries and leaves the station after which processing begins. 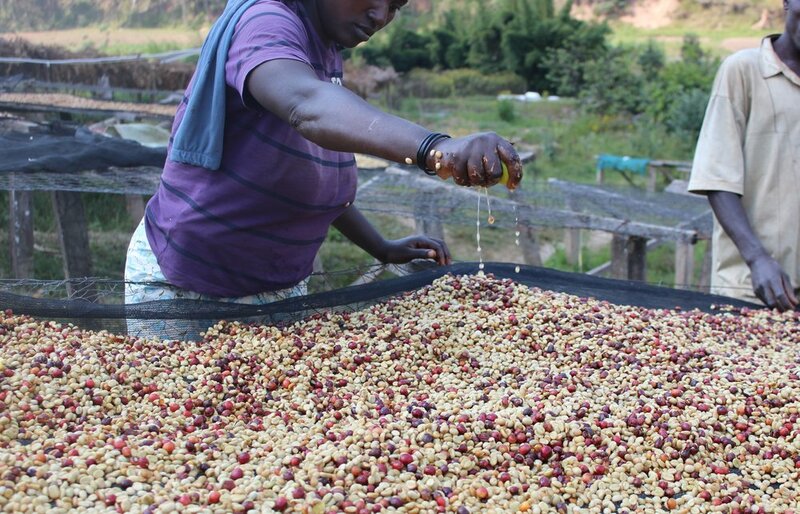 We mostly produce fully-washed coffee, but are now discovering new flavours through natural and honey drying processes. The cherries are poured from the reception tanks into the pulping machine which removes the cherry skin and part of the mucilage on the bean. It also separates the beans by high and low-grade quality. The pulper is the only machine used in the processing of our coffee - every other process is done by hand. The beans are left in fermentation tanks for a fermentation period. A small removable sign is placed on the wall of the tank that contains all the information regarding the fermenting beans. Once the beans have fermented, the mucilage water is drained and the beans are now referred to as 'parchment' because they still have a thin protective skin. Our workers then trample the lot to remove any remaining mucilage on the fermented parchment. After this, the parchment is given fresh water to move it into the washing-grading canal, where it is washed by our workers. In the washing-grading canal, there are two wooden barriers that separate the parchment by density. The higher-grade parchment is denser and will sink to the bottom of the canal while the lower grade parchment is less dense and will float. The latter gets drained with the water to the end of the canal. When it reaches the end, this parchment is poured directly into wooden trays and carried to the drying tables. The higher-grade parchment is moved by our workers from the washing-grading canal to another tank for a final wash with fresh water before being transported to the drying tables in nylon bags. The parchment is placed on long raised tables to dry under natural sunlight. The information for both grades of parchment is documented on paper and attached to the table where the parchment has been transferred to dry. Drying takes place from sunrise to sunset and the tables are covered with a sheet during the evening or when it rains. If the weather conditions are good, the parchment takes on average between 10 days and 4 weeks to dry. During this time, it is stirred regularly, the moisture level is carefully monitored and any parchment with visual defects is removed. Once it has fully dried and the right moisture level is achieved, the parchment is removed from the drying tables. Both high and low-grade parchment must reach a moisture level of 11,5%. It is then bagged and taken to the washing station store room where, once full, the coffee is moved to the dry mill where it is kept until the end of the season when it is finally exported. During the processing of natural coffee, none of the cherry's layers are removed and no water is used. After the cherries have been selected and weighed, they are taken directly to the drying tables. The coffee bean is dried inside its skin which changes colour from red to brown to black from drying under natural sunlight. Once it has reached the correct moisture level, the outer layer is hulled to reveal the dry green bean. This process requires more hand labour and almost double the time to dry than the fully-washed process. Just as we select cherries for fully washed, the same is done for honey processed and only the ripest cherries are picked to produce this coffee. Once selected, these cherries are kept overnight in the reception tanks and given fresh water regularly to neutralise fermentation. The beans are then pulped, left in a layer of mucilage and taken directly to the drying tables. Our workers then add a secret ingredient to the drying parchment to enhance the flavor and aspects of the coffee. The name of this process can be misleading, as most people assume that the coffee has honey flavour notes or that honey is used during the processing of the coffee. The real reason for this name is because of the sticky, honey-like feel of the mucilage on the bean before it is dried.